In this issue of the Cliffside News we are presenting a few views of the R. R. Haynes Memorial Building, which was dedicated Saturday, June 24th, when a formal opening was held. The ground was broken for this building in 1919, and the structure was completed in April of this year, 1922. It was erected in memory of the founder of the beautiful town of Cliffside, the late R. R. Haynes. The building has two stories and a basement. The basement is only below the ground on the front, and the ground has been excavated several feet from the wall on the front making the rooms as light as the story above. 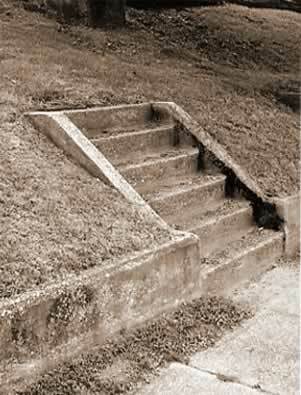 In the basement are the following: Gymnasium, two tonsorial parlors, two bath rooms, two rooms not yet in use. The gymnasium is one of the finest and best equipped to be found in the country. It is equipped for basket-ball, volley ball, indoor baseball and tennis. 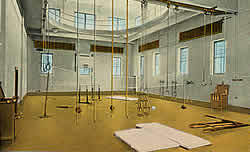 It has one giant stride, two sets of trapeze rings, one set each climbing rods and ropes, one set of six traveling-rings, punch bag, one cabinet of dumb bells, one cabinet of clubs, one rack of wands, parallel bars, medicine balls, three sets combination chest pulls which may be used for a number of different exercises; jumping and vaulting boards, wrestling mats. etc. The floor is perfect and smooth as glass. The barber shops are well equipped. Messrs. M. O. and Lytton Proctor are in charge of one of’ them and Messrs. Broadus Biggerstaff and Claude Hoye the other. They have other helpers at times. The bath rooms are supplied with the latest equipment, and have metal booths for the showers and dressing. They have lavatories and are complete in every way. The ladies’ have mahogany vanity dresser, while the men’s have a wall mirror. One of the vacant rooms mentioned above may be used a little later for a pressing club. The other room extends all the way across the front of basement with an alcove extending toward the center of the building. It has in it tables and oil stove, and may be used for a cafe at a later date. It has been used for oyster suppers, ice cream suppers, etc. There are two corridors leading from the bath rooms to the gymnasium, and in one of these is a large ice box lined with coils through which the water passes to the sanitary drinking fountains on each floor. About two-fifths of the space on the first floor is occupied by the theatre, which is the prettiest theatre in this section of the country. It is equipped with two of the latest models of the famous Symplex machines, and a splendid screen. The lighting fixtures are unique. It has four hundred and seventeen opera chairs. Two entrances at front and one in the rear to the fire escape. All doors in the entire building open to the outside. Mr. Chas. Swofford is manager, and puts on high class pictures. Recently he has given us “The Fall of Babylon,” “The Old Nest,” “Turn to the Right,” and many other fine features. Messrs. Robt. James and J. L. Cooper operate the machines. On the first floor as one enters from the front is the lobby. It is a beautiful room about forty-eight by sixty feet. From the center of the rear wall a fine brass rail extends half way to the front and on one side is a confection counter and the stairways leading to the bath rooms; on the other side are numerous tables where one may play chess, carroms, checkers, dominoes, and other games. One either side of the vestibule at the entrance are reading and writing rooms partitioned from the rest of the room by brass rails. The room is furnished with upholstered settees, rockers, arm and straight chairs. 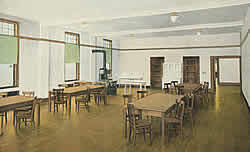 The reading rooms have massive library tables and four writing desks. Leading from the rear of the lobby is a short stairway to the balcony over the gymnasium, where one may watch the games and exercises in the gymnasium. Leading from the lobby and also a front entrance, a stairway leads to the second floor. 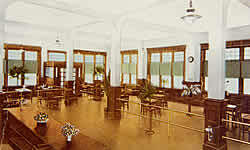 At the right of the landing is a large room for the use of the ladies. 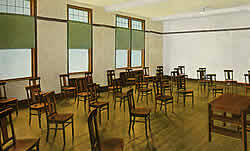 Here they may hold their club meetings, classes, lectures, etc. There is a bath room equipped with tub lavatory complete, adjoining this room. Next we come to the domestic science and banquet room, about forty by fifty feet. This room has two large closets, eight or ten feet square, lined with shelve for linen, dishes and the many things used in this department. 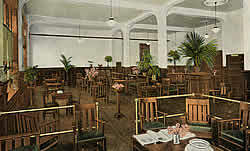 It has one of the most complete kitchen cabinets to be found, a majestic range, white enameled kitchen tables, and four eight feet by forty-two inches dining tables with gum tops. In the rear of the building is a large lodge room for the Masonic and K. of P. fraternal organizations. 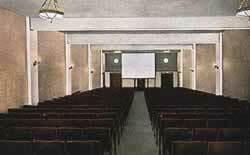 Next is the large, room for the men, for class work, lectures, etc. On the front are two private rooms with bath. The floors are all of A-1 white oak, and have been dressed and polished, and is laid on reinforced concrete and tile. The building is fire proof throughout as far as possible to be made. The large pavement in front is laid with blocks of cream and brown tile, except the entrance to the theatre, which is white, small octagonal blocks trimmed with brown and green. 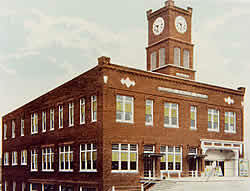 There is a tower on the front of the building in which there is a clock which occupies the entire tower. It is in three sections and reaches some thirty or forty feet above the roof. The first section contains the “works” of the Howard Clock. It is a marvel of mechanism. There are three sets of weights, and each are wound by separate motors. One of the weights is for the chimes, which chime each quarter hour, one for striking the hours, and the other to operate the clock. The bells are in the second section. The largest one weighs around a ton and has the following inscription engraved on it: “Erected to the memory of R. R. Haynes in 1920.” The hammers are controlled by cables leading from the clock on the lower floor of the tower. The shaft that operates the hands on the four dials extends through the center of tower to the top section and operates the four sets of hands. There are sixteen lights in the top section—four for each dial and these lights are turned on at evening and off each morning, automatically. The clock winds each of the three weights automatically. There are three secondary clocks which are controlled by this tower clock. There is one in the lobby of the building, one in the Cliffside Mill’s office, and one in the machine shop of the Mills. It all operates electrically. Note: the pictures that appeared in the newspaper in 1922 were black and white. They were used to produce the hand-tinted post cards we’re all familiar with (some of which are shown above).